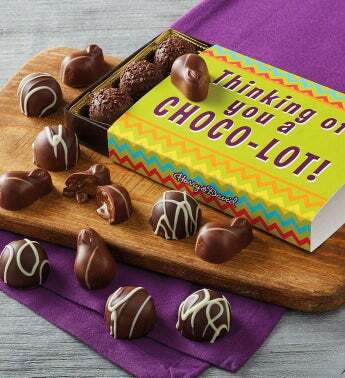 Let someone special know that they're on your mind with this gourmet chocolate gift. Inside a colorful gift box, they'll discover fifteen exceptional chocolates made in our candy kitchen. Starting with our signature chocolate recipe, these truffles come in four delicious flavors: dulce de leche, double chocolate, dark chocolate raspberry, and dark chocolate.